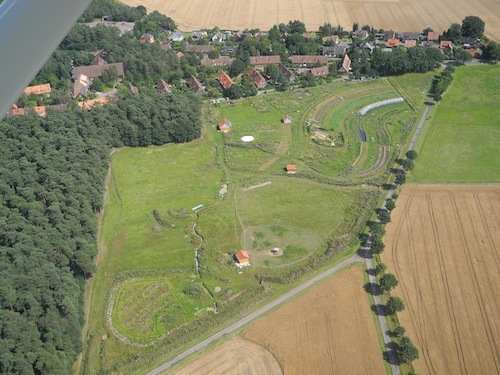 The project PaLS aims at a practical application of permaculture design principles on a piece of farming land adjacent to the Lebensgarten ecovillage settlement. It is a research and demonstration project and is also food security for the residents of Lebensgarten. The fruit and vegetables are sold to the households directly as a vegetable box or through our food co-op, are used in the kitchen for the seminar guests and/or find their way to household in the region around Steyerberg. The project also demonstrates to the seminar guests and the people of the region what can be produced on very poor earth in this northern German climate through new planting methods and soil improvement. ‘Terra Preta’ (black earth) is being used to improve the sandy soil and is comprised of freshly cut hay, manure and charcoal powder, with many other ingredients mixed and laid out in layers in low covered mainly anaerobic beds. Another aim of PaLS is to be financially independent as soon as possible. The project is not profit oriented – so any profit made, at a later stage, will be turned back to the community purse. 2) the creation of community as the basis for creating a high level of self-sufficiency, self-development and mutual assistance among members. PaLS is a logical extension of the other community owned non-profit companies that have been established over the years since the foundation of Lebensgarten in 1985. These include a school for mediation, an educational department, and a cultural events department. The project shows lots of innovative practical applications of Permaculture principles. It is a research and demonstration project, which will serve also as food security of the residents. The agricultural and forestry areas in conjunction with water and energy elements produce together an integrated research project for living lightly on this planet.